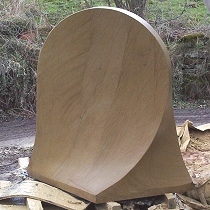 The Millhouse Bell - 2013. 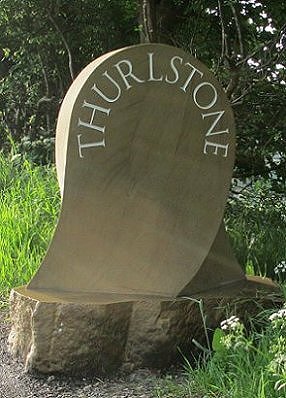 A village boundary stone on the A628 between Millhouse Green and Thurlstone. 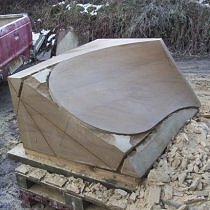 Overall height: 40", overall width: 41", overall depth: 24". 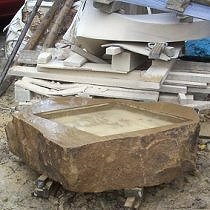 Sandstone set into a sandstone base. 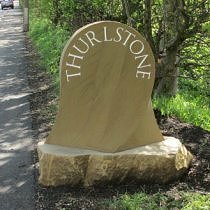 Smaller versions can be commissioned for house name stones or memorials. 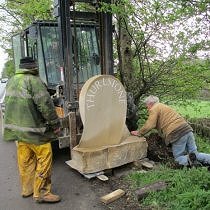 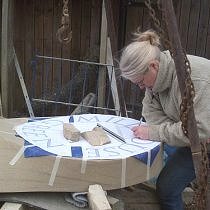 The Bell is a collaborative work with Roger Hunt of Hillside Quarry, Elizabeth Stocker, who designed the lettering, Dave Bedford, who engraved it, and Nigel Tyas who helped design and make specialist lifting gear to slot the bell into its base stone. 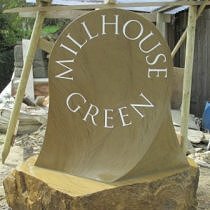 The bell was commissioned by Millhouse Green Village Community Association. 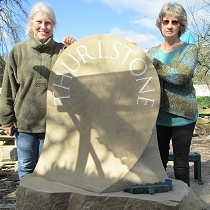 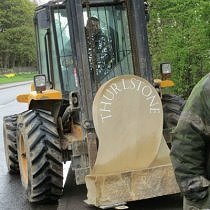 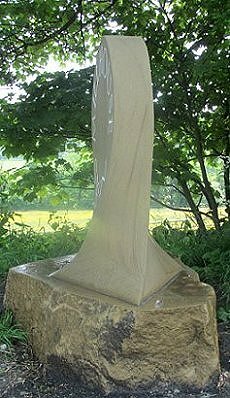 During the initial series of talks in the commissioning process with Ingrid Law and Helen Rutland of the Millhouse Green Village Community Association, the boundary stone gained its nickname �the Bell�. 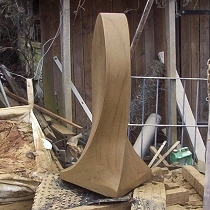 They thought the design reminiscent of the shape of a bell and so the name stuck. 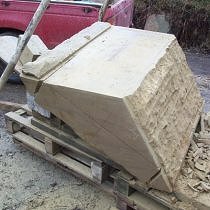 The initial block of stone was quarried and cut at Roger�s quarry, and transported to my home, Rose Cottage, where Elizabeth and I produced the sign. 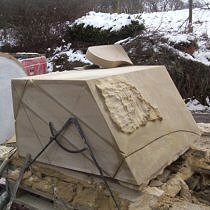 The finished work was later taken to the site by Roger. 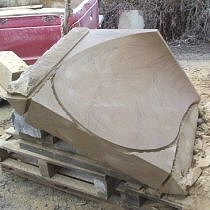 We took pictures of the different stages of production and these can be seen below. 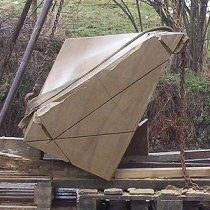 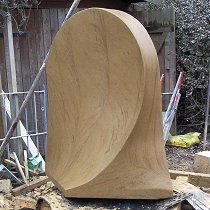 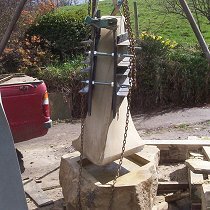 The geometric design of the bell is an adaptation of one I had used before in the base section of the Hillside Quarry obelisk (click here to view the Hillside Quarry obelisk). 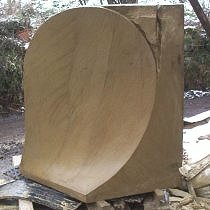 The cross-section transforms from a perfect diamond at the base to become rectangular, at which point the warping stops and the two largest faces become plane surfaces, which were then cut into semicircles to take the lettering. 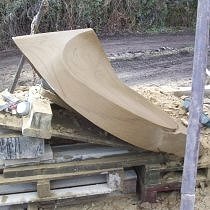 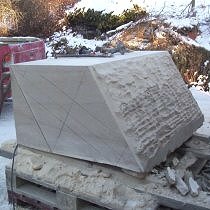 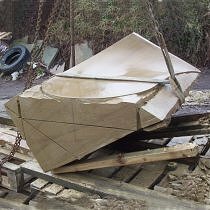 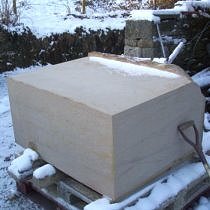 There was a size constraint � this block was the largest block with the necessary proportions which could be cut by Roger�s saws. 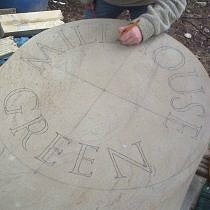 The design is in fact a reworking of the ancient traditional way- marker- stone design, with a modern twist. 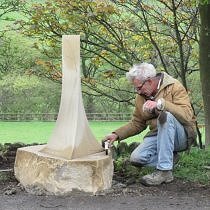 This collaboration has drawn together the different skills of many people - Roger, Elizabeth, Dave, Nigel, Ingrid and Helen all brought a great deal of enthusiasm to the project. 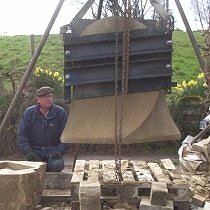 www.hillsidequarry.co.uk - Roger Hunt. 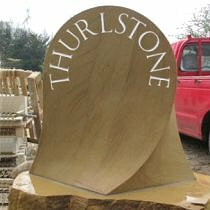 Hillside Quarry, Thurlstone - suppliers of Quality Yorkshire Stone. 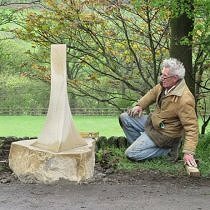 www.nigeltyas.co.uk - Nigel Tyas. 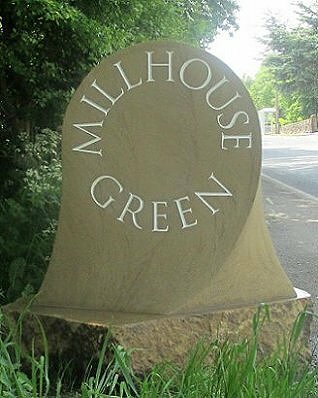 Nigel Tyas ironwork, Millhouse Green - designer and manufacturer of traditionally made wrought iron lighting. 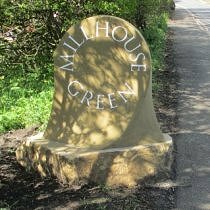 www.millhousegreenvca.org.uk - Millhouse Green Village Community Association. 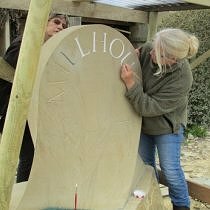 Chairperson - Ingrid Law, Secretary - Helen Rutland. 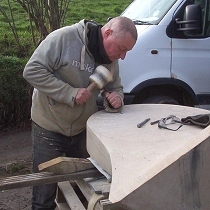 Dave Bedford. 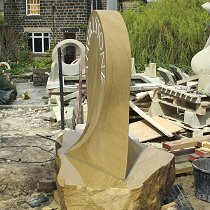 Undercliffe Stones - Contact telephone : 0113 2537442 / 07736 523154.